Man, oh man. What a week! Work hard, play hard was the name of the game this week. On Tuesday night, I celebrated my bestie’s birthday at the season kick-off of the Millennium Park Summer Film Series. On Wednesday evening, I got to go to a fabulous dinner party where Joe Flamm from Top Chef was cooking at a luxury apartment building in Chicago, Two West Delaware. Oh my gosh, you guys… IT WAS SO GOOD! And Joe was so nice. I met him briefly on New Year’s Eve at Spiaggia, but it was such a treat getting to talk to him while he was grilling and throughout the intimate dinner party. Thursday morning was so fun, too! I got a tour of the new Serena & Lily store on Armitage and then got to have lunch at Summer House with some of my favorite bloggers here in Chicago (Liz, Kelly, and Danielle), as well as some new friends, too. Oh, and I finally checked out AIRE Ancient Baths this week! You absolutely have to go… I’ll be sharing more on that soon! And then on top of all of that fun stuff, there were just a lot of work things. Calls on calls on calls, a meeting with my lawyer, proposals due, more podcast recording, photo shoots, photo editing, and lots of planning and writing for upcoming blog posts and projects. Exhausted would be an understatement, but at least it was fun! The dark circles are starting to look like bruises, you guys. On the workout front, I took a killer Sculpt class at Core Power Yoga on Monday night (Bradford in the South Loop) and holy f*ck… I hadn’t been to sculpt since before Coachella and I was honestly hobbling until yesterday. My legs are still kind of sore, to be honest! I went to my favorite restorative class, Deep Stretch at Yoga Six, last night and it was just what I needed. Weeks like this are hard for me… I listened to my body and took a few days off, which was a blessing in disguise since my schedule was so packed anyhow, but my mind always feels so chaotic when I don’t get my daily workout in. Anyway, let’s get on to this week’s finds… Shall we? Chicago friends: YOU HAVE TO GO VISIT THE SERENA & LILY STORE ON ARMITAGE! It opens today and they’re having lots of fun in-store happenings this weekend to celebrate. (And 10% of proceeds will be given back to a local Chicago charity this weekend, too!) Check out my Insta Stories for more photos… So gorgeous! I was suuuper bummed to hear that Jess Lively is taking a hiatus from her podcast. This was one of my favorite podcasts I listened to this week… A must-listen. I desperately need new pajamas. These, these, these, this, this, and these are all in my cart(s). Speaking of a trip to NYC, I’ve got to make one!! There’s a Harry Potter-themed Afternoon Tea and Potions Class. Sign me up. This hair mask is on my list of things to buy & try! I really want to try these white jeans! Can’t wait to try this new Frank Body Scrub… It’s birthday cake scented! How cute are these gingham sneakers?! I have this french bralette in a few colors, but I’m going to need the gingham. Striped, knotted espadrilles… Yes, please. I tend to look terrible in yellow, but this dress is tempting me. A Harry Potter tea? I think we need to alarate there right now! In those gingham sneakers of course, because they are the cutest! Would you ever consider hanging your blankets from hooks in the living room like the photo at Serena & Lily? It honestly never occurred to me but I don’t completely hate it. Trying to figure out if it would work in real life or just look totally off. I think it’s a really cool way to add texture to a wall! I don’t have a wall where it would work to do it in my living room, so I can’t try it out. However, I think it has to be done very specifically … I don’t think you could just hang the blankets you already have. I think they’d all have to be the exact same size. 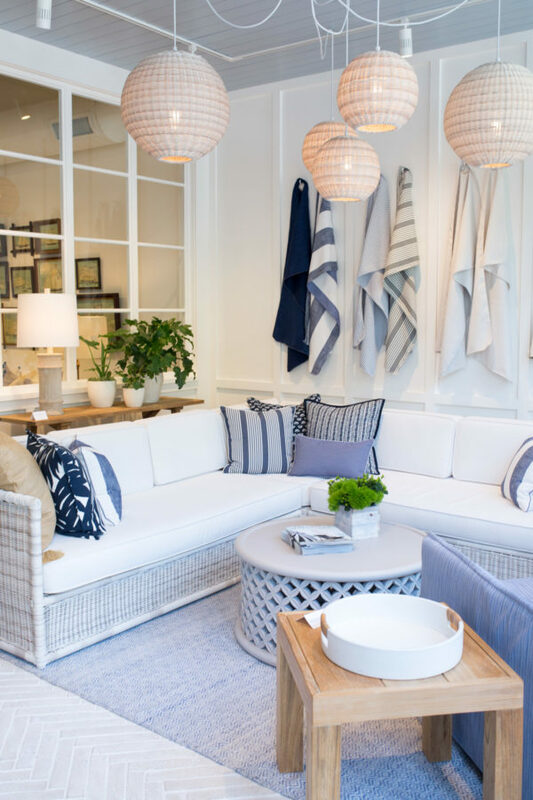 I think it’s SUCH a cute idea for an outdoor space (cute near a fire pit with blanket), it would definitely work in a beach house, or going to/from a pool with towels. CPY’s sculpt class is always a killer for me, even if I feel like I’m in the best shape of my life!! I crave that burn 🙂 but then am ALWAYS sure to have plenty of epsom salts for a bath post-sweat sesh! Makes all the difference.